New Zealanders often bemoan the fact that we are so remote from anywhere else. There’s not much we can do about geography, but we could sometimes make a greater effort to relate our own situation to what is happening in the rest of the world. A case in point is the upheaval that occurred last month in the global debate about economic policy. The economic world, for a moment at least, tilted on its axis, but we have sailed serenely on as though nothing has happened. The story is a simple one. Most people will know that the current government, from the moment it took office in 2008, has insisted that its top priority must be to cut spending and reduce the government deficit, thereby becoming a founder member of what is by now a dwindling group of countries that maintain that austerity is the correct response to recession. On the face of it, this stance seems to run counter both to the Keynesian lessons we thought had been learnt from the Great Depression of last century and to the practical experience today of those countries that are finding themselves mired in recession while pursuing austerity policies. But the proponents of austerity have been encouraged to stick to their guns, in the face of mounting evidence that they are on the wrong track, by the work of two highly regarded Harvard economists. Carmen Reinhart and Kenneth Rogoff published an influential paper called Growth in a Time of Debt in 2010 which purported to show that a country with international debts equal to 90% or more of its national output would suddenly experience a sharp fall in its growth rate. For those countries with high levels of debt (and we are one of them), the lesson was clear. If they are to grow and escape recession, they must reduce the level of debt. Reinhart and Rogoff’s paper became the favourite reading of the US Republicans (and particularly of Paul Ryan, their Vice-Presidential candidate), and this goes a long way to explaining the difficulties President Obama has had in persuading Congress to support his counter-recessionary strategy. It wasn’t just on paper that Reinhart and Rogoff peddled their message; they appeared in person before a House Committee and assured the legislators that there was not a moment to lose – that, far from stimulating the economy, it was essential to start cutting immediately. The European Union economic policy chief, Olli Rehn, currently presiding over the worsening economic performance across the euro zone, is another enthusiast; and the British Chancellor of the Exchequer, George Osborne, in a Britain that has lost its top credit rating and has only just escaped a triple dip recession, is another to take comfort from the support offered by Reinhart and Rogoff’s research, which he is fond of citing at every opportunity. The story has now, however, taken an unexpected turn. A young graduate student at Massachusetts University Amherst, Thomas Herndon, was required, as an exercise, to replicate Reinhart and Rogoff’s research. He was downcast to find that, try as he might, he could not do so. The young man finally discovered the truth; the Reinhart and Rogoff research was vitiated by fundamental errors. He published, with the help of two senior colleagues, the results of his work, and created a sensation which is still reverberating around the world. The catalogue of mistakes is shocking. Reinhart and Rogoff had simply omitted through an oversight some of the key data; they had capriciously given excessive weighting to some minor factors (including, interestingly, New Zealand’s low growth rate in 1951 – the year of the waterfront strike) that had skewed the results; they had assembled the statistics in bands so as to suggest that there were tipping points (such as a 90% debt to GDP ratio) that were in fact artificially constructed; and even if their conclusions had survived these errors, they had hardly considered the possibility that any correlation between high debt and growth rates might have shown that slow growth produced high debt rather than the other way round. What this means is that policies that have kept millions out of work, condemned many to continuing poverty, destroyed a number of European economies, and weighed down the whole global economy and its prospects have been based on sloppy research and political prejudice. It seems unlikely, however, that the architects of austerity will be deterred. Their convictions remain unshaken. They will go on crucifying the poor and vulnerable, even in the face of both practical and theoretical evidence that they are mistaken. Even Paul Ryan, Olli Rehn and George Osborne, however, cannot match Bill English and John Key for insouciance. Our government remains committed to the austerity path; it does not see the need even to acknowledge, let alone concede, that the intellectual underpinnings of the policies they are pursuing have been shown to be without foundation. It is little comfort to our unemployed (still at historically high levels) and disadvantaged that they can make common cause with millions of other victims around the world of what looks increasingly like a cruel deception. The revelation that Growth in a Time of Debt, the influential 2010 paper by leading economists Reinhart and Rogoff, was vitiated by basic errors has removed one of the last credible underpinnings of the contention that austerity – and reducing the deficit at all costs – is the proper response to recession. But it is not just miscreant economists who have egg on their face; it is our political leaders too. The translation of the Reinhart/Rogoff findings into a simple ‘rule’ that a debt to GDP ratio exceeding a tipping point of precisely 90% produces a precipitate slump in economic growth has been the intellectual foundation of policies advocated and implemented by politicians across the western world. 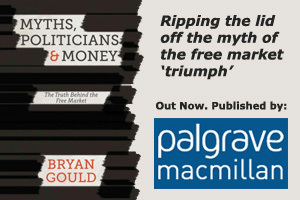 The two economists have frequently been cited as champions of austerity by Paul Ryan, the Republican vice-presidential candidate, by Olli Rehn, the European Commission’s economic chief, and by George Osborne, among many others. How did these luminaries come to accept and implement such a literally counter-productive policy? The answer is that there are very few politicians who are competent to make their own judgments on major economic issues. What most of them do is cast around for arguments that support their own political prejudices – and that is all the easier if those arguments are offered from within the comfortable confines of current orthodoxy. Reinhart and Rogoff were endorsed and applied (mistakes and all) because it is what political leaders wanted – on political grounds – to hear, and because it accorded with the ‘free-market’ doctrines that have dominated western economies for nearly four decades. A George Osborne, for example, found that the supposed ‘90% rule’ gave him all the scope he needed to justify and target the true aims of his policy – smaller government and ‘rolling back the state’. The dependence of political leaders on advice – especially on economics – is not new; but it matters more than ever today as the dangers of such dependence become clearer. While the austerity message is increasingly contested on grounds of historical experience, Keynesian economics, and the need to establish the direction of causality in respect of any postulated correlation, the thinking of most people is still corralled by those powerful forces which seized control of the global economy decades ago. There can be little surprise that advice from these quarters is extremely congenial to right-wing politicians. For most of them, economics is a simple business. They see no distinction between running a country’s economy and their own experience of running a business. Even when they think about the wider economy, their decades-long experience of monetarism leads them to believe that the essence of a successful macro-economic policy is a backward-looking insistence on stability and getting government out of the way. They are simply unfamiliar with the kind of thinking that has allowed other economies to grow and prosper. It is less easy to explain why politicians from the left of centre have been equally unwilling or unable to think for themselves. But the sad truth is that most simply assume, like Tony Blair, that economics is a difficult and technical business that can safely be left to the bankers, and is therefore no longer their responsibility. They tell themselves that the economic process is probably immutable anyway, and that the real business of politics is in any case about other issues. They place more value on the plaudits of the powerful than on the reproaches of the dispossessed. Even a Gordon Brown – who was widely thought for a time to be a master of economic policy – can now be seen to have been merely a prisoner of his orthodox advisers. He, at least, seems to have had the intellectual capacity to re-think his position to some extent since he left office. The result is that our political establishment offers no one able and willing to break new ground, to consider, let alone advocate or act on, neglected issues that are nevertheless of great importance. Where, for example, is the debate about the need to improve competitiveness if we are to grow without running into the constraints of inflation and trade deficits? What about rejecting destructive austerity in favour of replacing – as the Japanese are doing – the banks’ monopoly over credit created for non-productive purposes with credit created by the central bank and directed – not into banks’ balance sheets – but in accordance with an agreed industrial strategy into productive investment? What about restoring macro-economic strategy as the responsibility of an accountable democratic government rather than leaving it as the preserve of an ‘independent’ central bank? And, above all, what about making full employment, on economic as well as social grounds, the central goal of policy?